Rainer Zietlow and his team are driving a new 2017 Volkswagen Amarok V6 3.0 TDI. The car has been let from the German Volkswagen Nutzfahrzeuge press-park, so it is a standard car with the new V6 diesel engine, which produces 224 hp/3000-4500 and 550Nm/1400-2750. 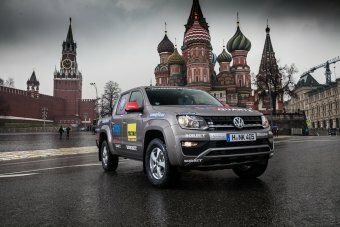 For the world record long-distance run the team will make a little modification for longer and safety driving – the Amarok has an additional LED high-beam light in front off the radiator grille and a 300 litres additional fuel tank on the pickup. The V6 TDI engine is filled with lubricants of Total Quartz. 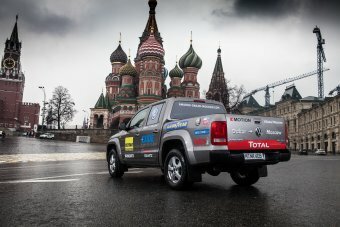 During the world record drive, the team is going to take two samples of the engine oil of Total Quartz on different distances. Textar equipped the Volkswagen Amarok with a new set of brake pads and Borbet – with a special set of four new light-duty wheels. The Amarok uses a new and standard battery from Exide, to keep all additional electronic devices running throughout the whole record drive. To embody the power and performance of Amarok`s V6 engine, Goodyear supports Rainer Zietlow again on his world record project with brand new developed Wrangler All-Terrain Adventure tyres strengthen with a Kevlar inlet.